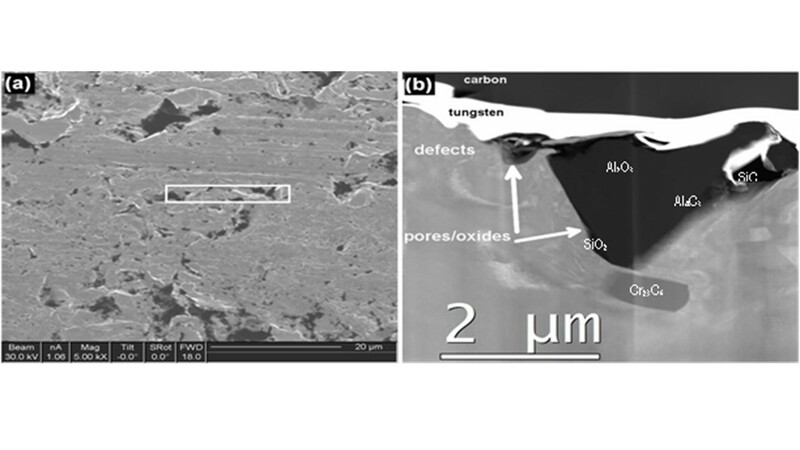 Microstructural identification of synthesized steel with significant local content has been carried out. Alloy ingot was prepared using a casting technique. The samples were then formed into bulk steel by a machining process. A high resolution powder neutron diffractometer (HRPD) was used as an equipment for characterization. By applying neutron diffraction techniques, a ferritic steel profile can be resulted in as well as ‘minor peaks’ belong to impurities formed in the sample. These impurities can be identified as small amounts of Al2O3 54SiO2, Al4C3, SiC and Cr23C6. Scanning transmission electron microscopy (STEM) combined with energy dispersive X-ray spectroscopy (EDX) confirmed and revealed neutron identified phase distributions. Joint Committee on Powder Diffraction Standards (JCPDS) least square curves calibration can precisely calculate the dhkl parameters of each reflection plane. As a comparison, another sample of alloy ingot was also investigated using neutron diffraction. The pattern was free from crystal impurities. Rietveld refinements provide satisfactory goodness of fits Rwp = 10.42% and reliability factor S = 1.7. This was so-called a ‘real bulky’ sample of a 73Fe24Cr2Si0.8Mn0.1Ni ferritic steel alloy. In summary, there are some ‘impurity’ compounds, as evidenced by the unidentified reflections in the measured neutron diffractogram. The neutron diffraction techniques revealed, in addition to the ferritic steel profile, some minor peaks which belong to impurities formed in the sample. These impurities can be identified as a small amount of Al2O3 54SiO2, Al4C3, SiC, and Cr23C6. Scanning transmission electron microscopy (STEM) combined with energy dispersive X-ray spectroscopy (EDX) analyses confirmed and revealed the neutron identified phase distributions. JCPDS least square curves calibration can precisely calculate the dhkl parameters of each reflection plane of impurities. As a comparison, another specimen taken from the middle of an alloy-ingot was also investigated by neutron diffraction. The pattern was free from crystal impurities. Rietveld refinements give a satisfactory goodness of fit Rwp = 10.42% and reliability factor S = 1.7. This was then called a ‘real bulky’ sample of 73Fe24Cr2Si0.8Mn0.1Ni ferritic steel alloy. The writers would like to express thanks to the Head of PSTBM and BSBM, Dr. Arbi Dimyati, Dr. Andon Insani, Drs. Agus Hadi Ismoyo, Mr. Imam Wahyono, Mr. Rohmad Salam and Mr. Heri Mugihardjo for their kindness and help. Also, the writers thank to GFE-RWTH Aachen in Germany, and the financial support of DIPA 2015.